Cross-contamination is an ongoing challenge facing all facilities maintenance and custodial service personnel and represents a significant barrier to the efficacy of even the best cleaning programs. To understand the issues with cross-contamination, you must first understand what it is and why it is a problem. Cross-contamination occurs when people spread germs from one surface to the next simply by touch. How long someone touches a surface doesn’t matter; you touch a surface, you’ve transferred a portion of the bacteria. Eighty percent of all common illnesses are spread by hand to mouth, nose and eye contact. Walking from an unclean floor to a wet freshly cleaned one. Aerosolized mold spores that have attached to clothing or other fabric. Using unlaundered cotton string mops and unsanitized mop buckets to clean multiple floors. Germs, mold, and bacteria spread quickly and can survive for days, sometimes weeks, depending on the surface and local environment. While most of the available research regarding cross contamination surrounds the healthcare and food services industries, recent reports have shown that it is a problem affecting organizations of every kind, and the methods employed by custodial staff when cleaning is central to addressing the challenge. Studies have shown that microorganisms can survive on inanimate objects or surfaces for hours, days, weeks or even months. 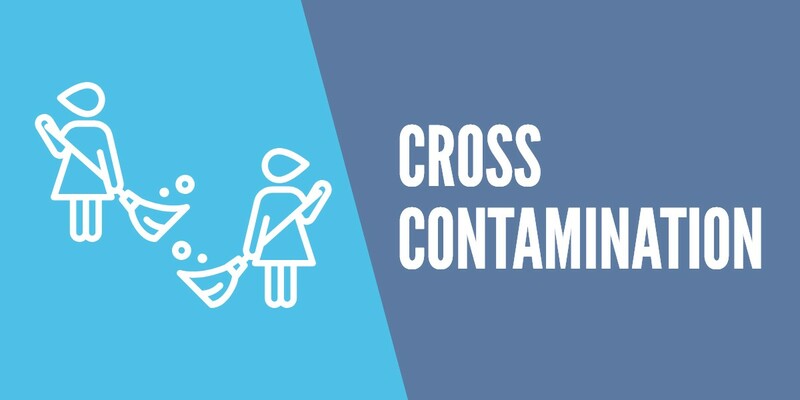 Cross-contamination is defined as the spread of germs from one surface or object to another and frequently occurs when performing janitorial tasks. Effective cleaning and disinfection protocols can reduce the prevalence of cross contamination in the facilities we clean. There are many ways that cross contamination can occur while performing janitorial tasks. Contaminated mop heads and towels are common culprits. However, a recent study has identified a less recognized cause of cross contamination: janitorial worker’s gloves. Researchers have found that germs can survive on gloves (like other surfaces) and can be transferred from one surface to another while cleaning. Use color-coded microfiber towels, mops, and brooms--assigning each color to a specific room or surface, and change out the equipment when moving from dining areas, restrooms, or to different floors of a building. Combine the color-coded microfiber tools with the two-bucket cleaning method to reduce cleaning product/water contamination. Clean each room from top to bottom, then disinfect, starting with the point furthest from the exit, then work your way out. Use disposable cleaning gloves, or monitor longer-term use gloves for wear and tear and disposed of immediately. Ensure the custodial staff and building occupants follow strict hand washing guidelines. Cross-contamination is one of the leading causes regarding the spread of germs, bacteria, and dangerous mold spores from surface-to-person and person-to-surface. Unfortunately, many of the conventional cleaning methods employed by a facilities custodial staff are contributing, as opposed to combatting, the costly and potentially dangerous consequences of surface cross-contamination. Outsourcing your organization's cleaning and infection control services to a provider experienced in cleaning for health first initiatives is a proven method of rapidly onboarding safer and healthier janitorial practices. If you would like more information regarding cross contamination issues and how it affects the health and wellbeing of your facilities occupants or would like to schedule a free onsite evaluation to address all of your organization's cleaning and infection control needs, contact us today for a free quote!